Actually this project is for a friend who lost a pet back in mid December. She wrote a rather creative paragraph about her lately deceased pet, Albus Dumblekitty, chasing mice up at a king's cross station in the sky. So I tried to illustrate it...ish. It's not set in the sky, but set on the eve before Hogwarts students are supposed to board the Hogwarts express. 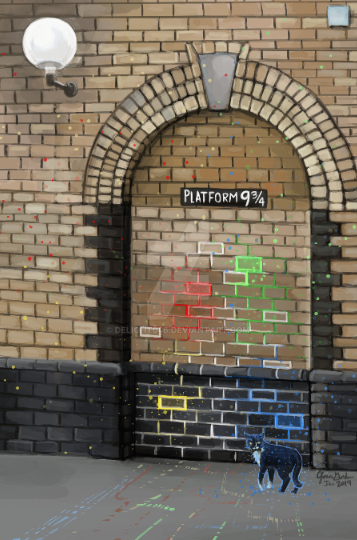 Albert is catching mice at the station, guarding platform 9 and 3/4. Calibrating magic on the floor is there for speedy travel. Sometimes, the repetitiveness helps me out of an art block. Like practicing drawing something over and over again. I like the look the cat is giving. Like it's saying, "Are you curious? Would you follow me?"